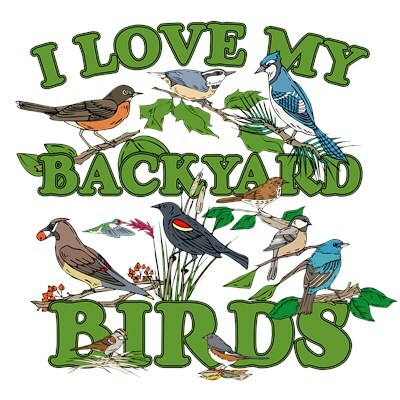 This fun design made for back yard bird lovers features illustrations of eleven backyard favorites. The birds are: American Robin; Red-breasted Nuthatch; Blue Jay; Cedar Waxwing; Ruby-throated Hummingbird; Red-winged Blackbird; Black-capped Chickadee; Indigo Bunting; Rufous-sided Towhee; White-throated Sparrow and Song Sparrow. They are perched around text reading I Love My Backyard Birds. This original design makes a great gift idea for anyone that enjoys birding in their very own back yard. To order by phone, call toll-free at 1-877-809-1659 from Monday - Saturday 9:00am - 9:00pm EST. You'll need to note the Product Number 030-1319305797 to make your order.